The first known case of clogged arteries, or atherosclerosis, has been found in the mummy of an Egyptian princess, said a study presented at a major US cardiology conference. Researchers have long known that ancient Egyptians suffered from plaque build-up in the arteries that supply the heart. However, the latest finding suggests that the syndrome may be more prevalent, and mysterious, than previously thought. 'Commonly, we think of coronary artery or heart disease as a consequence of modern lifestyles, mainly because it has increased in developing countries as they become more westernised,' said Gregory Thomas of the University of California, Irvine. 'These data point to a missing link in our understanding of heart disease, and we may not be so different from our ancestors,' he said. 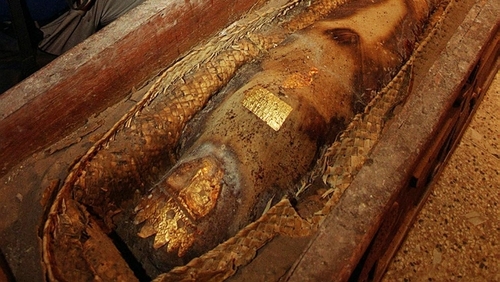 Researchers performed computerised tomography (CT) scans on 52 Egyptian mummies to determine whether they had atherosclerosis. Of the 44 that had detectable arteries or hearts, 45% of them had calcium build-ups in their vessel walls. The oldest among them was an Egyptian princess who likely lived between 1580 and 1550BC, and probably died when she was in her early 40s, researchers believe. Even though ancient Egyptians ate a leaner diet, including less meat, and did not smoke cigarettes, they ended up with the same disease as modern humans. But that does not mean people should disregard modern research, said co-author of the study Adel Allam of Al-Azhar University in Cairo. 'Recent studies have shown that by not smoking, having a lower blood pressure and a lower cholesterol level, calcification of our arteries is delayed,' said Mr Allam.